Most Frequently Asked Questions About the Whole Process. Got a question on your mind? If you have a question that you need answering you should find a resolution below. If it's not a question we've thought of, then please let us know, and we will add it to help future customers with the same query. 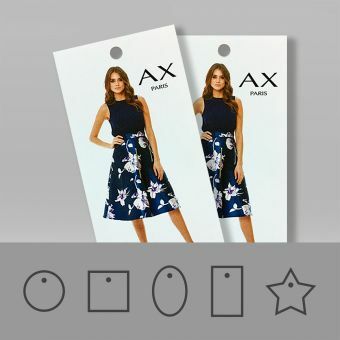 First and foremost we're here to help our fantastic customers in any way we can to make their Handy Tags shopping experience as smooth as possible. We have made available lots of useful information throughout the website from artwork template downloads, to our fantastic FREE online design tool. We will continue to strive for perfection wherever we can and always love to hear constructive feedback on how we can improve our service to you. Our standard ‘next day delivery’ to any UK mainland destinations is already included in the price you see online, so no hidden surprises at checkout you’ll be glad to know! All deliveries outside mainland UK will incur an additional charge at checkout which will be displayed before you proceed with paying for your order. To what destinations do you deliver? We deliver throughout the UK, Scottish Highlands and Islands, Northern Ireland, Southern Ireland, plus Europe. If you require your order to be delivered to a non-European destination, this is also possible, but we will need to quote on a bespoke basis as this is not an online service we offer at present. It all depends on which delivery method you have chosen and the contents of your order. After you’ve placed an order, we will email a PDF proof for you to approve. Once we’ve received your print approval, we aim to print, finish and dispatch all online orders within 48 business working hours, excluding weekends and Bank Holidays. Please note - Approvals after 1 pm will automatically fall into the next full business day. Offline custom orders could take longer; please allow for this. If you live in an EU country, South or Northern Ireland, Southern Scotland, Isles of Scilly or Isle of Wight. This is sent through a different delivery service, so allow for extra days in delivery. Do you guarantee delivery within 48 hours? No, this is not a guaranteed serviced, it’s an estimated timeframe that we aim to operate 99% of the time. Occasionally there can be circumstances where your order may be slightly delayed due to stock availability, postal strikes or other circumstances beyond our control. If your order is going to be delayed beyond what is stated, then we will do our utmost to email you in advance to let you know. You have our guarantee that we work extremely hard to get all orders dispatched within the timeframe above but will not guarantee any delivery to a set time. We cannot accept any responsibility or issue compensation for any delays in delivery. If your order is time sensitive, please let us know, and we can advise you accordingly. I need my order in 24 hours, can I pay extra for faster delivery? We already use a next day delivery service as standard, so this service cannot be improved upon. However, if we can speed up the printing and finishing process of your order, we will always do our utmost to help you. If you require a more guaranteed resolution, resulting in scheduled orders being moved to make room for yours, then there will be an additional charge. Please talk to our friendly customer service team for a bespoke quotation. What time of day do you deliver and will I be notified? You can check the status of your order within ‘your account’. We will inform you when your order is being processed and when it’s been dispatched. Once your order is showing as complete, you will receive an email or text via our courier DPD with a tracking number and delivery date and time. Your order can be tracked right up until you’re holding your handy order in your hands. What happens if I miss my delivery slot or need to change the time or day of delivery? You’re in complete control of your delivery; it is your responsibility to arrange a suitable alternative address, date or time. You can arrange for our courier to leave your parcel in a designated place. Our courier will photograph where your parcel is left (recycling box, porch etc.) and email notification to us as proof of delivery. Please note: We cannot accept any liability for missing orders if you have asked for this non-signed for service. Can I ask for you to deliver to a neighbour if I’m not going to be in? Can I collect my order directly from Handy HQ? Yes, we’re always happy to see our customers. 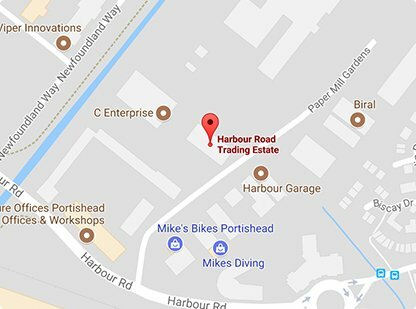 Our printing headquarters are located at Handy Brand, Unit 6 Harbour Road Trading Estate, Portishead, Bristol BS20 7BL. We will inform you of a collection date and time after your order is placed. Can you deliver under plain packaging? We can deliver directly to your customer in plain unbranded packaging. Just let us know in the comments box when placing your order. Can you deliver my order to multiple delivery addresses? Yes, we can arrange this for you, but it’s not a free service. There will be an additional delivery charge for every additional delivery address you require. Due to restrictions in contracts between ourselves and our couriers we cannot deliver to PO Boxes. I’ve supplied the incorrect delivery address with my order, what should I do? It is your responsibility to supply the correct address when placing your order. We cannot be held responsible for lost packages due to incorrect delivery details. If you notice the error before we’ve scheduled your order in for despatch, then please call us immediately on 01275 460517 with the correct address, and we will amend it for you. Alternatively, if you order has already been scheduled in, you will need to wait for your SMS text or email notification from our courier to make different arrangements. Why has my order been returned to Handy HQ due to non-delivery? If your order is returned to us, this could be for a couple of reasons. The delivery address that you supplied with your order may be incorrect, or the courier company may have tried delivering on several occasions without success. We will contact you to let you know that we have them. If you require us to dispatch them again, we will charge or standard delivery rate to do so. Do you produce your own swing tags or are they outsourced? No, we print every swing tag order in-house. We believe in adding the personal touch to every order we produce, so we don’t outsource like other tag printing companies. It also allows us to keep full control of print quality and colour consistency from job to job. Also, this is the reason why our turnaround times are rapid. What is the best file format to supply my artwork in? What is the best file format to supply my artwork in? Any design that uses graphics and text elements (mainly any content that doesn’t include photographic content) are best supplied in vector format in the form of either a vector PDF or EPS. The beauty of vector files is they’re not resolution dependent, for example, they can be scaled up to any size without loss of quality. This will ensure your design stays as sharp as possible throughout the printing process. 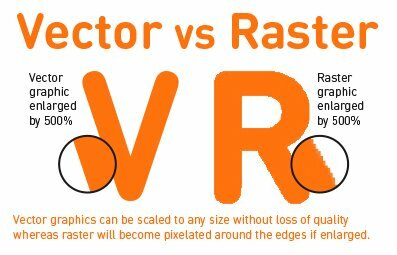 Please see the below comparison between vector versus raster graphics. A raster graphic is typically an image file such as JPEG, TIFF, GIF and PNG. Our artwork department can handle the majority of files to be as flexible as possible. You probably already know we love vector PDF files as it offers the best printing quality. Don’t despair if you’re unable to supply a vector PDF as we can accept Adobe Illustrator AI, Adobe InDesign INDD, Adobe Photoshop PSD, EPS, JPEG, PNG, BMP, GIF, Microsoft Word and Microsoft Excel. Please ensure all font’s and images are embedded within your document if applicable. 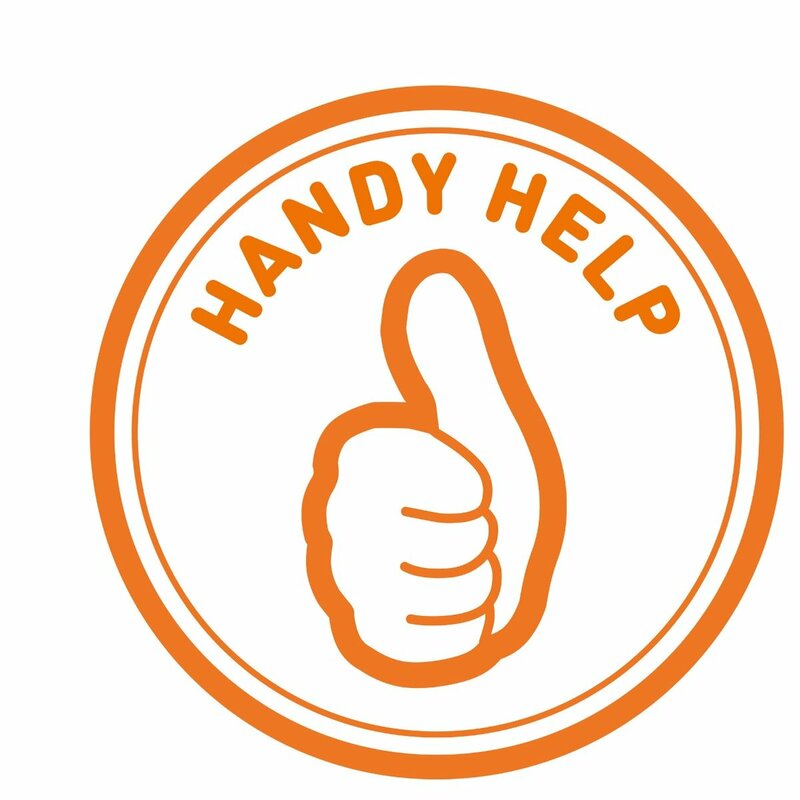 If you’re unsure how to do this then just call our handy artwork team for assistance. 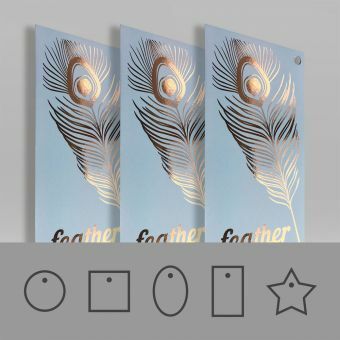 What is a PDF and how do I create a PDF to send you for my artwork? PDF stands for Portable Document Format is a widely becoming the industry standard for sharing artwork digital files and documents. You can save your PDF using the Adobe PDF/X-4 preset. This is a tried and testing format for printing a typical PDF at it’s best settings. What do DPI and PPI resolution stand for? Let’s start with DPI, Dots Per Inch, this is the resolution your printing machine outputs at. It’s important to note when designing artwork you should be concerned with PPI, Pixels Per Inch. Most graphics grabbed off the web will be 72ppi, this quality is classed as low resolution when a printing process is concerned. We recommend a minimum of 350ppi up to 600ppi to achieve optimum printing results. It’s important to remember that, if you have a 72ppi graphic and simply try to increase it’s resolution to 350ppi will not increase the quality of the image. All you will be doing is enlarging an already low-resolution graphic. Your action would be to open the original (native) graphic then increase the resolution to your required PPI. 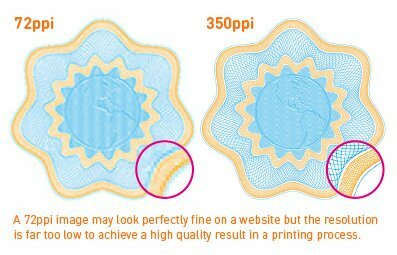 Please see the example below which shows the difference in printed quality between a graphic of 72ppi versus 350ppi; there’s a big difference! 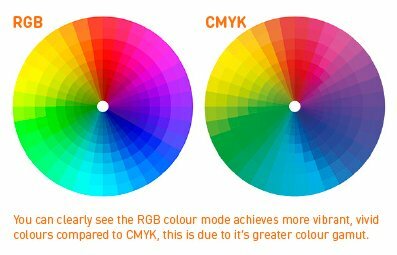 RGB versus CMYK, what’s the difference? RGB stands for ‘Red, Green, and Blue’ and are dots of light that your computer monitor and TV screen display in. RGB has a very wide range of colour and is not printer friendly. All of our printers use a 4-colour ink/toner process CMYK - Cyan, Magenta, Yellow and Black (K). This is the industry standard for representing ink on paper and what we use to transform your digital files into printed media. To tell the difference between RGB and CMYK, take a look at the example below of an RGB colour wheel converted to CMYK. The vivid colours appear true on the RGB wheel but are impossible to replicate in CMYK. Colour wheels are showing the difference between RGB and CMYK. If you use RGB colours or images within your design, we will need to convert them to CMYK, which could make the design appear washed-out when printed. I need a reprint, will the colour match my previous Handy Tags order? Every day our printing machines are calibrated for colour accuracy to European standards. There's no reason why your reprint should look any different to what you've received previously. We always retrieve your previous orders master copy from our archive to double check colour is consistency. 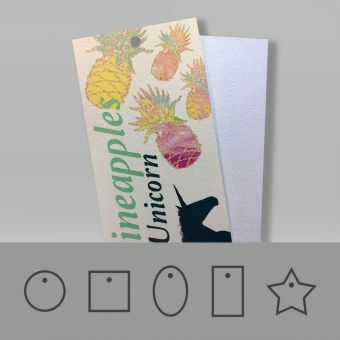 Will my printed product match the colour of the PDF on my computer screen? Not necessarily, all monitors are displayed in RGB, and we use a CMYK printing process, some colour variation will naturally appear. Our printing machines and monitors are calibrated to a 'Coated FOGRA 39' colour profile. 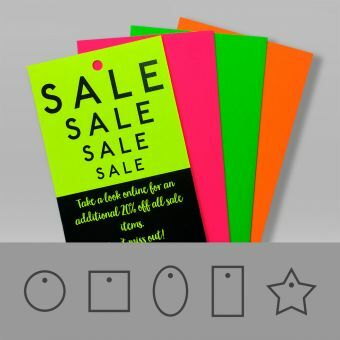 Important to remember, if you're viewing PDF proofs on a smartphone the colours can vary significantly. 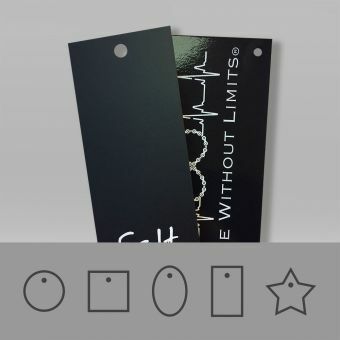 Can you print a dense black on my swing tags? Yes, if you require a dense black, please make sure your CMYK values are set to the following. C: 50% M: 50% Y: 50% and K: 100%. We will match as close as possible to a Pantone colour of your choice. Please note this will be using a Pantone Process matching system not a Pantone Spot colour matching system. You will need to make sure your supplied artwork is set to the correct Pantone reference for this to be possible. 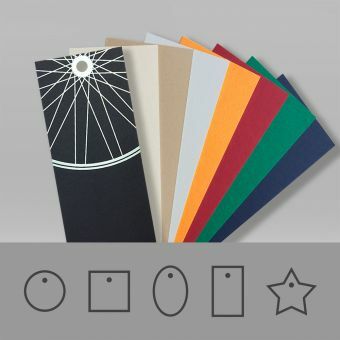 Please note, not all Pantone colours can be matched in a digital CMYK printing process, but we will get as close as possible by referring to our Pantone to CMYK colour swatch books. 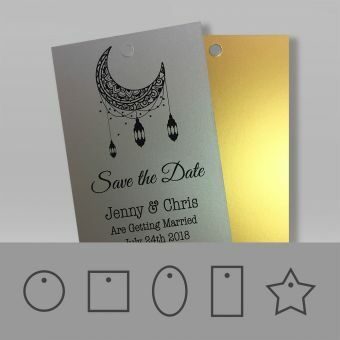 Unfortunately, metallic ink printing is a process we don't currently offer. Alternatively, we can foil your artwork to achieve a luxurious look. For sure, many of our swing tag materials will allow for this printing process. Our white ink printing looks great on our Colour Board and Brown Kraft swing tags. How small are you able to print the text on my artwork? Due to our high-quality digital printing process, we're able to print text at very small sizes. We recommend a minimum of 6pt text for it to be legible to your customer's eye but we're able to print smaller. 100% black text will always give you the sharpest possible result. Can I have a border printed close to the edge of the swing tag? 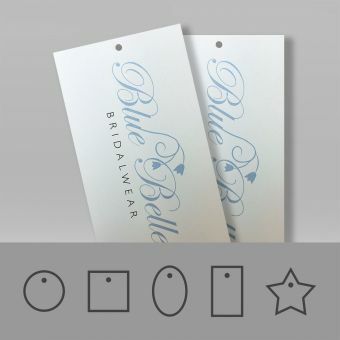 We always recommend keeping your border 3mm inside the tags trim edge due to the natural movement throughout the printing and finishing process. By following our safe zone guidelines will ensure you achieve a professional look. If you ignore our safe zone guidelines, then you will run the risk of your border appearing uneven once your tags are trimmed down to their final size. Please check our artwork guidelines and a more in-depth example. Can you print multiple designs on the same order? At present, you're only able to order a single design per order online. 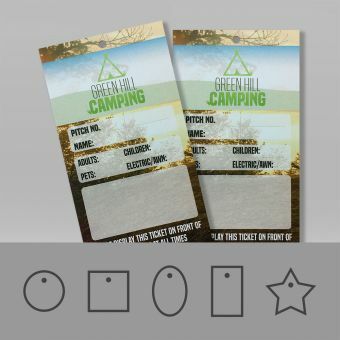 If you have multiple designs you require printing, then please contact our friendly team on 01275 460517. We will calculate the most cost-effective custom quotation for your needs. I have a custom shaped tag, can you produce this? Yes for sure, we can print and cut virtually any shape in all of our swing tag materials. For all custom orders, please contact 01275 460517 and one of our team who will be ready to help. I require a size not listed in your standard template sizes, what should I do? There's an option to add a custom size on every order page, making it easy to order any size online. 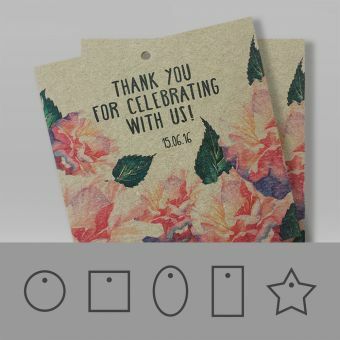 Will you send me a proof to preview before you print my order? 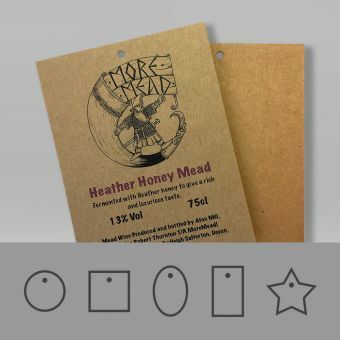 Firstly you will see a thumbnail preview of your swing tag design in your shopping basket before your order is processed. Once we've received your order, our artwork team will proceed to create your print-ready PDF proof for approval. We will only schedule your order into production once you have given email authorisation to do so. Yes, we do. Our creative team are very good at what they do. With many years of design knowledge available at their fingertips, they have a great idea of what makes a good design and what doesn't. Let us show you what we can do! Do you have preset swing tag templates I can download and use? We certainly do. We have made available templates in all of our online shapes and sizes in various design application formats. Choose from Adobe Illustrator AI, Adobe InDesign INDD and Adobe PDF formats. We've tried to make the payment process as easy as possible by offering many different payment options to suit our customers. We accept Visa, Mastercard, Maestro, Paypal, Apple Pay & Android Pay. We do not accept American Express/AMEX. Yes, we offer a secure payment service. You will see our website displays the padlock symbol and https:// prefix which ensures security. We work very closely with Braintree which is a service of Paypal to provide the most up-to-date systems for secure online payments. Rest assured we never store any payment details and take your security very seriously. Can you send me a Paypal request? Yes, this is something we can arrange. Your order will need to be processed offline by one of our sales team. Please call 01275 460517, and we will help you with placing your order. Yes, you can pay by cheque. You will need to place this type of order offline with our sales team. Please call on 01275 460517, and we will help you through the process. Please note we will need for the funds to clear before proceeding with your order, this could add several days delay to your order. I'm a registered charity and VAT exempt. How do I place my order? Once you have supplied us with a current valid charity number, we can then remove your VAT from the order. This type of order will need to be processed offline by our sales team. Please get in touch on 01275 460517. 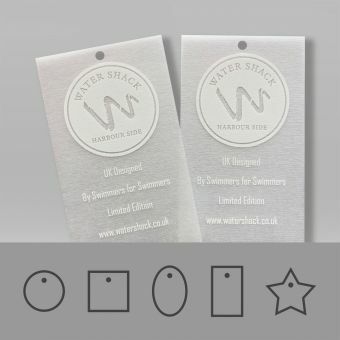 Can I order an exact reprint of my swing tags? Yes for sure. All you need to do is log in to your account, select the order you would like to be reprinted and pay for your order. We archive your print files so we will have them on hand, ready to call up for your reprint. A couple of important things to remember, firstly, we do not re-proof reprints of previous orders, if you specifically want to see a PDF proof you will need to let us know. Secondly, your order will need to be an exact match for material, shape, size and quantity to be classed as a reprint. Otherwise, you will need to place a fresh order. We all have a responsibility to look after the environment, as we all have a stake in our amazing planet. We recycle all waste and printing consumables, and we dispose of all of our eco printing inks using an environmentally friendly process. Our digital printing process is quick, efficient and cost-effective which has less impact on our environment, so please think green and do your part to cut down on waste. This is why we encourage our customers to only order what they need rather than having surplus stock left wasting away on a shelf. All of our material suppliers have environmental credentials and share our same high standards, we insist on it. We could buy cheaper uncertified paper produced from virgin rainforests, but we set our environmental policy higher than this. We know our customers expect this of us, let's continue to support these vitally essential schemes together.